About ⋆ D.S. Tequila Co.
D.S Tequila Co. – Established in 2010. D.S. Tequila Co. is a contemporary casual, full service, tex-mex restaurant and bar in the heart of Lakeview, Chicago. Our menu features gourmet à la carte tacos, cooked to order burgers, quesadillas, giant salads, and a wide assortment of appetizers to share. We regularly feature creative chef style tacos and burgers to keep your taste buds entertained and our menu exciting. Our burgers are made with a half-pound of 100% prime beef and come with sweet and spicy fries. We proudly make our flour tortillas by hand each morning, blend our salsa, guacamole, and queso every day, and use the freshest produce available. Each taco is made to order and you can mix and match as much as your heart desires. On Thursdays come hungry; we feature our legendary All You Can Eat Taco Night after 5pm (some restrictions apply, see calendar for details). Our beer list boasts 14+ drafts, and over 50 bottled and canned beers that change with the seasons. Enjoy our ever-changing frozen drink menu year-round. We regularly create fun new recipes with popular spirits and premium ingredients. Perfect for a summer day on the patio, or after work chill out session. All drafts, specialty drinks, frozen drinks, and margaritas can be ordered regular mug size, fiesta bowl (40oz) or in pitcher sizes- making our drink list perfect for large groups and big parties. Each week we feature two amazing pub-game nights. Wednesday night Team Trivia is interactive, visual, and we regularly host special theme nights around pop culture and current events. Please check out calendar for specific dates and details. Thursdays, we feature Gringo Bingo with our vintage bingo board and ball machine. Join us on the weekends and holidays when we feature Chicago’s top DJs until 2 am Fridays, and 3am Saturdays. We attract an eclectic range of people ready to party all night, but please note we are 21+, without exception. With our cement poured bar top and cast-iron fixtures we have party-proofed this place for any occasion! Our greenhouse glass enclosed patio is open year-round, features a retractable rooftop, and is heated in the winter. Perfect for any special occasion or holiday party up to 150 guests. Please contact us for current party package rates and we’ll be happy to help plan your next big event. Awesome burgers, great tacos, & premium tequila – setting the standard for good times & unforgettable memories. We look forward to serving you! Born in Mexico, raised in Chicago! D.S. Company Tequila is serious tequila. Unlike some of the other “premium” tequila producers, its Weber Blue Agave plants are grown for eight years with no artificial accelerants to speed their production. The sugars from these blue agave plants are allowed to develop naturally. This produces a taste so smooth and rich, you won’t believe it’s tequila. We believe that being part of the norm is boring. Edgy and tough, DS Tequila is made with excitement in mind! We believe that quality should be affordable; therefore, our focus is on you. 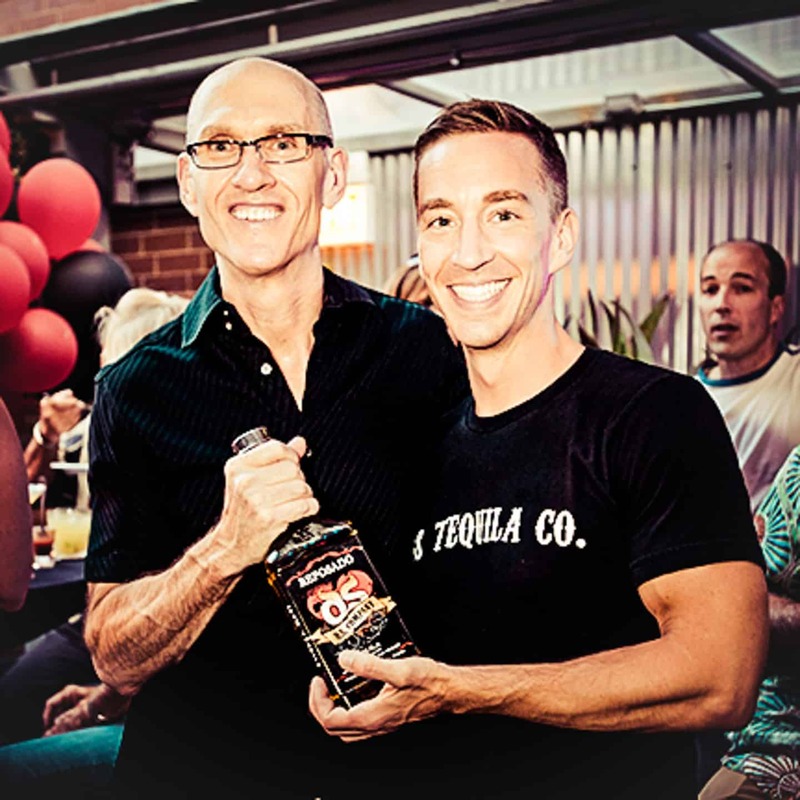 OUR tequila enthusiasts demand quality, 100% Blue Agave Tequila with an image that makes a real margarita fun again. We are the Party – and if you feel like we do, well then…welcome to our world. For we are those who choose to drink D.S. TEQUILA, and this is the D.S. philosophy. All of our specialty tequila cocktails, margaritas, and frozen drinks are proudly made with D.S. Company premium tequila. All three varieties are now available for purchase at our restaurant (in house only). ​Makes a great gift or conversation piece for your next party! D.S. 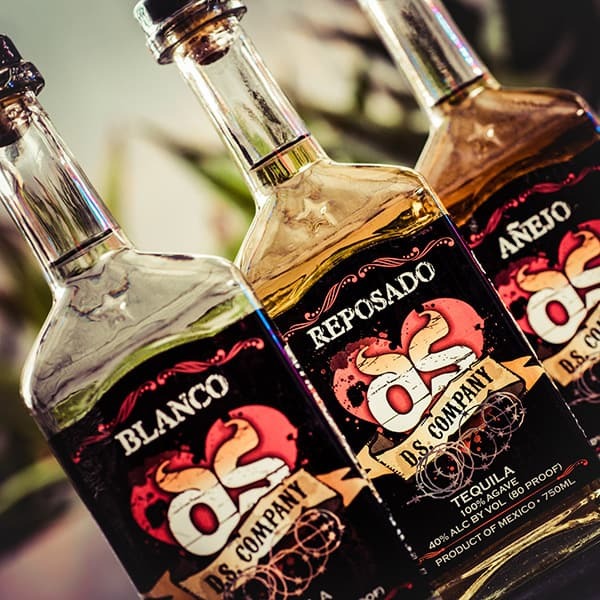 Company’s “Official Blanco” is made from 100% Blue Agave plants that have been estate grown for at least 8 years without any artificial accelerants to speed their growth. The double-distillation process also insures the handcrafted product to be clean, sweet and pure. Soft to the palate with a creamy silky texture, with aromas of vanilla and a lingering smooth finish. D.S. Company’s “Official Reposado” is made from 100% Blue Agave plants that have been estate grown for at least 8 years without any artificial accelerants to speed their growth. The double-distillation process also insures the handcrafted product to be clean, sweet and pure. Aged for 7 months in bourbon casks, you’ll find a hint of spice and oak. Medium-bodied with some floral aromas, the finish is long and satisfying. D.S. Company’s “Official Anejo” is made from 100% Blue Agave plants that have been estate grown for at least 8 years without any artificial accelerants to speed their growth. The double-distillation process also insures the handcrafted product to be clean, sweet and pure. Aged for 1 ½ years in bourbon casks, D.S. Company’s Official Anejo has a beautiful amber color, a scent of well-aged agave and oak. The palate senses a touch of caramel and toasty nuts, with a beautiful and long finish of lingering spices.